We offer far more than just traditional waste collection services. With our friendly two man collection uniformed team and the latest waste removal equipment and knowledge. You can rest assured that what ever your rubbish removal in London needs, KwikSweep will give you peace of mind every step of the way. Kwiksweep offer a specialist service. We do this by ensuring that all waste is dealt with in the most environmentally responsible manner. We always leave your premises in a clean and tidy manner. 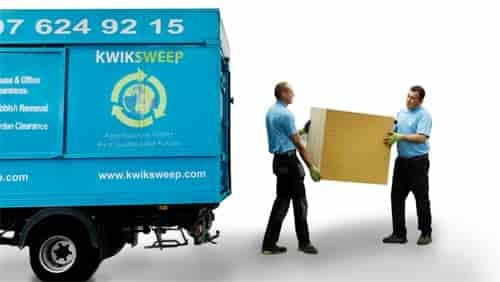 Kwik Sweep is a leading rubbish removal company, our service is adept in offering a junk removal package that is bespoke to every one of our customer needs and requirements. Whether you have a single item in your house or a whole office floor, hotels accommodations to large student blocks, small garden sheds to large retail strips outs, from high rise apartments to underground basements, or to your after party rubbish clearance. Whichever you need, we can clear it in an affordable, reliable and peace of mind service. Waste collection does not have to be stressful or hard work. This is why our friendly team will guide you every step of the way. From your first phone call to the end of your rubbish removal. Our junk clearance staff will do all the loading no matter where in the property your garbage waste is. Thinking if getting a skip? We are a great alternative as you only pay for the exact junk that is removed. We also load all your junk and sweep up afterwards. We are available 7 days a week for any and all rubbish disposal enquires that you may have. Our service can get to your location on the same or next day for those emergency collections. Our junk removal team in London have cleared waste from houses, flats, offices, gardens and commercial premises. There is no disposal too big or too small. We are also a fully licensed waste disposal company and provide all customers with a duty of care transfer note which details that your junk will be disposed in the correct manor. We stand by our Logo statement 'aggressive on waste for a sustainable future.' This is embedded in our company's ethos, backed up by a strong environmental policy. So whether we're providing a house clearance service, rubbish removal in London, or waste disposal you can be sure we will reuse and recycle as much as possible. We turn up at a time that suits you and we will clear all your junk in an environmentally friendly manner.